The classic tournament competitor's favorite reel has been reinvented to make a whole new standard of performance accessible to the weekend angler! The venerable Stradic is now fitted with Shimano's Paladin Gear Durability Enhancement and Propulsion Line Management systems, including Aero Wrap II worm gear oscillation and advanced S-Concept balancing, for totally smooth, crisp handling over the long term. Aluminum frame and spool, Fluidrive II; Dyna-Balance; Floating Shaft; Super Stopper II; waterproof drag; maintenance port. Includes a FREE spare aluminum spool. "I recently purchased another Stradic to go along with my current line of 3 others. They are great reels, absolutely smooth and a wonder to fish with! 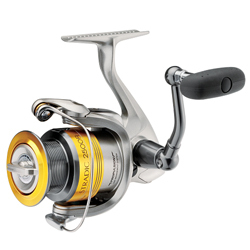 That being said, I read a lot of other user's reviews comparing this reel with the Stella." "I usually have always bought quantums in the past for my spinning reels but wanted to try something new. One major thing was I wanted a lighter reel without breaking the bank and I have found it with a 3000 model." "Great reel. I use the 4000 series to chase Small to Medium Tuna and the drag is nice an smooth and handles with no worries." "
"Bought this reel for shaky heads. works great, amazing drag, smooth, solid frame. i love shimano but personally dont think this reel is any better than the quantum energy pti and its more expensive."